In this beautiful and haunting debut novel in verse, called “a tender piece on connectedness” in a starred review from Kirkus Reviews, a Japanese-American girl struggles with the loneliness of being caught between two worlds when the tragedy of 9/11 strikes an ocean away. Eleven-year-old Ema has always been of two worlds—her father’s Japanese heritage and her mother’s life in America. She’s spent summers in California for as long as she can remember, but this year she and her mother are staying with her grandparents in Japan as they await the arrival of Ema’s baby sibling. Her mother’s pregnancy has been tricky, putting everyone on edge, but Ema’s heart is singing—finally, there will be someone else who will understand what it’s like to belong and not belong at the same time. As her mother grieves for her country across the ocean—threatening the safety of her pregnancy—and her beloved grandfather falls ill, Ema feels more helpless and hopeless than ever. And yet, surrounded by tragedy, Ema sees for the first time the tender side of her grandmother, and the reason for the penny-pinching and sternness make sense—her grandmother has been preparing so they could all survive the worst. Dipping and soaring, Somewhere Among is the story of one girl’s search for identity, a sense of peace, and the discovery that hope can indeed rise from the ashes of disaster. With a Japanese father and an American mother, eleven-year-old Ema has always been a part of both countries by living in Japan during the school year and spending summers in California. 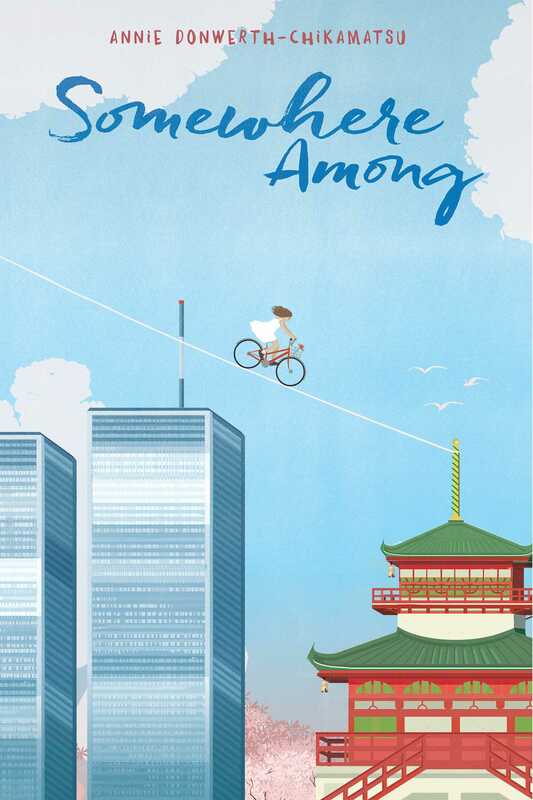 Ema’s life in Tokyo changes for the worse when her parents decide that she and her pregnant mother must move in with her Japanese grandparents the summer before 9/11 changes the world. Dipping and soaring, Somewhere Among is a beautiful novel in verse that explores one girl’s search for identity and inner peace, as well as how to discover that hope can indeed rise from the ashes of disaster. 1. “Our bags sit by the door, ready. On the balcony I look up into our patch of sky. Goodbye, View. At the door, fighting tears, I look into our one room apartment. Goodbye, Home” (p. 3). What is Ema feeling as she says, “Goodbye, Home”? What is the definition of home? Do you know or have you encountered a time when you had to move? How did you feel? America. There, Americans would say I am half . . . Here, Japanese would say hafu if they had to say something” (p. 7). Do you know anyone who has parents from two countries, cultures, or religions? Describe Ema’s attitudes toward having a father from Japan and a mother from the United States. 3. When Grandpa Bob airmailed a NASA pen to Ema, he wrote, “Think beyond the borders, reach for the stars, map your own world” (p. 10). What did Grandpa Bob’s note mean to Ema? Throughout the story, the reader learns the significance of the NASA pen. Why does Ema find the pen so important? How is the NASA pen connected to the relationship between Grandpa Bob and Ema? Do you possess an item that is significant to you? Why is this item important to you? 4. Do physical features define your place in the community where you live? What makes one feel a sense of belonging? How can you define beauty beyond physical characteristics? Can your physical description/appearance define your nationality? 5. When writing wishes to celebrate Tanabata, “Obaachan was the first to hang her wishes. She is wishing for our health and good fortune . . . Jiichans’ wish, the only wish he makes, for a happy home” (p. 50 – 51). Compare and contrast the wishes of Ema’s grandmother and grandfather. Do their personalities reflect their wishes? If you could grant a wish, would you choose Obaachan’s or Jiichan’s wish? Why? 6. Early in the story, when Ema and her mother move in with her paternal grandparents, Ema learns the rules of the house. “We are marionettes dangling from Obaachan’s tight fists” (p. 88). What does Ema mean by that statement? How can her papa help her in this situation? Why is Obaachan tight-fisted with money? Find passages from the book. Have you, or one of your friends, experienced an adult with “tight fists”? How did you react? How could a person remedy this type of relationship/situation? 7. Obaachan is so concerned about manners and culture but do you think she is bullying Mom and Ema? How is she making sure Ema knows how to be Japanese? Does Ema do anything to make Obaachan doubt her? 8. “From the window, I see Jiichan standing beside a bicycle, a small one for me! . . . It is an auspicious day: I make my own luck, I have a bike here” (p. 153). What does this bicycle mean to Ema as she claims it is an auspicious day? Why would she want a bicycle? Describe the relationship between Ema and Jiichan. 9. “A dust cloud swallows New York City. There is more—a plane went down in Pennsylvania and the war department of the United States of America in Washington, DC is in flames. Mom sinks into the floor, I cannot find my breath . . . Breakfast was our last meal in peace” (p. 211). When Ema’s mom learns of the tragedy of 9/11, Ema’s mom is “confused, horrified, crushed” (p. 210). What reactions would you have if you were Ema’s dad or Ema’s maternal grandparents and were unable to contact your loved ones? Have you, or one of your friends, encountered a tragic circumstance? What feelings did you, or a friend, express during this time and how? 10. Throughout the story, Donwerth-Chikamatsu writes one-sentence chapters (e.g. “Many nations quickly say ‘sorry’ to America” from page 215 or “On a shinkansen outside Tokyo, Papa hurries to meet Little Sister” from page 305). What is the author’s purpose in having one-sentence chapters? How do you think the author selected which chapters only had one sentence? Was the use of one-sentence chapters effective in the story? Why or why not? 12. After the 9/11 attacks, Ema says, “I want to be up and away . . . I would cut the cord to Earth, escape into your silence, find a different view. I don’t want to see or hear or feel any more sadness” (p. 225). Explain this quote. What is Ema feeling during this time? 13. Ema’s father works long hours with a four-hour bus and train commute to provide for his family. “He is worn down, tired and weak . . . Poor Papa, he is home sick” (p. 250). What does the author imply with “he is home sick”? Does the meaning of the phrase change if she wrote “he is homesick?” Explain the difference between “home sick” vs. homesick. 14. Upon the arrival of her little sister, Ema finds the perfect name in her mom’s collage. fingers. She likes it” (p. 300). Do you agree with Ema’s choice for her sister’s name? Why would “future” and “hope” be perfect for her sister? If you could name a younger sibling, what would you select? Why? 15. “Tonight, the coldest night so far, I soak in the hot bath too long. Obaachan is tired and not pleased . . . I am wondering which is worse: cold or hot, silence or fussing” (p. 349). Ema reflects on her relationship with her grandmother, Obaachan. What are the similarities between cold and silent? Hot and fussing? Which would you choose: a silent relative or a fussing relative? Why? In what situations would you choose the other? 16. Why does Ema slap at Masa? Why hasn’t she reacted like this earlier in the story? 17. During Christmas, Ema realizes the miracles that happened to her family: the origami doll from the stranger, Obaachan getting a tree for Christmas, an Easy-Bake Oven cake, Obaachan smiling, Ema’s little sister Miki, peace in Ema’s heart. Recount the importance of each of these. Of these miracles surrounding her family, which is most important to Ema? Why? If you could provide another miracle for Ema, what would it be? 18. Why does Jiichan ’s health fail? How does this impact the family? 19. “Looks like, sounds like, feels like a happy home” (p. 433). Define the word “home.” What are positive attributes of a happy home? What would Ema define as positive attributes for her happy home? How can a happy home turn into an unhappy home? Can an unhappy home turn into a happy home? How? 20. Why did the woman on the train give the doll to Ema? Why would a Japanese woman give her a message in English? Ema is sensitive to be singled out for not being Japanese, but does Ema react to the English? Why or why not? 21. Why did the author choose the title Somewhere Among instead of Somewhere Between? 22. What can you do to work on your heart in difficult times? What could you do to bring family members or classmates together? Context: Throughout the story, we learn of many Japanese holidays and celebrations. Activity: Have students use library resources and the Internet to research one of the Japanese holidays—its history, customs, and other related facts. Working in groups, students will create a trifold poster that includes the name of the holiday, its history, and its customs. Each group of students will present its findings to the class, using the trifold poster as a visual aid. Materials: Colorful strips of paper cut 1.5” x 6”, hole punch, ribbon or string, black felt-tip markers, bamboo branch. Context: In Japan, Ema celebrates Tanabata with her Japanese grandparents and her parents by writing wishes onto strips of paper and then hanging the strips of paper onto bamboo. (pp. 48 – 53) These wishes on the paper are known as Tanzaku. Activity: Reread Ema’s Tanabata celebration. (pp. 38 – 53) Punch holes on the short end of a strip of paper, so the strip is vertical. Using black felt-tip markers, have students write their own Tanzaku on the bright strips of paper. Next, have students thread the ribbon or string through the hole to hang on the bamboo. Have students read their poems to the class. Ask if Tanabata reminds them of any other holidays. Context: Chigiri-e is a Japanese art form in which the primary technique uses colored paper that is torn to create images, and may resemble a watercolor painting. The technique dates from the Heian period of Japanese history, when it was often used in conjunction with calligraphy. Activity: Reread the passage in which Ema and her mother are doing projects together (pp. 122 – 24). Share children’s picture books that use torn paper as an illustrative form (e.g. Eric Carle, Lois Ehlert, Debra Frasier, Steve Jenkins, Ezra Jack Keats, Leo Lionni, Nancy Stone Wallace, Ellen Stoll Walsh, Ed Young). Using old magazines and wallpaper sample books, have students create their own artwork using torn paper. Context: “(Masa) runs full steam . . . he rams my thigh with his broom. I sink into silence to the floor. I double in pain . . . No one has hit me before. Ever” (pp. 183 – 84). “I slap slap slap at his arms, and scream, “For sure I am God of Hell! Watch out!” . . . I charge him, grab his arm, pull. My aggression is stunning. He pulls free, scrambles, runs. Now who’s the bully?” (p. 369). Activity: Free-write about a time when you, or one of your friends, have been hurt by bullying. Are there peers or friends in your circle who would stand up to the bully? Have you ever reacted like Ema to become the bully? Who are the adults in your life you can trust to help? How do you think schools should address bullying? What’s in Your Obento Box? Context: “The class is interested in mine: wiener cut like octopus, sweet egg, broccoli, grilled fish, onigiri, tomato, all sitting on a lettuce leaf. Mine is the best-looking obento, they say. I savor each bite like it’s my last meal” (pp. 274 – 75). Activity: Have students create their own versions of obento boxes by either cutting out pictures of food or drawing pictures of food. Alternate activity: Have students create their own obento boxes at home to eat for lunch at school. Context: Throughout the story, heart plays an important role in Ema’s life. Using one of the “heart” quotes from Somewhere Among, have students create a heart that defines that quote from the story. Context: At times, Ema’s educational experience is similar to those found in an American education. However, Japanese education has some unique qualities. Activity: With a partner, have students draw a Venn diagram on their paper. Have the students label one circle “Japanese Education”; label the second circle “American Education.” Have students brainstorm similarities and write those similarities in the overlapping area. Then have students brainstorm unique attributes of both a Japanese and an American education. Students will then write the unique attributes in the respective circles. Each partner group will share their Venn diagram with the class. On the book cover, Ema is riding her bicycle on a tightrope. Have the students share their interpretation of the cover design. Then have each of them illustrate or design their own cover for Somewhere Among. Have them share their covers with the class and explain their interpretation. Have students make a paper doll of themselves. See here for inspiration: https://www.craftsy.com/blog/2016/02/how-to-make-paper-dolls/ or http://www.auntannie.com/FridayFun/DollChain/. Author Annie Donwerth-Chikamatsu made dolls in celebration of International Dot Day, which is a celebration of creativity inspired by Peter H. Reynolds’ book The Dot. See Annie’s dolls here: http://www.celebridots.com/2016/08/annie-donwerth-chikamatsu.html. This guide was created by Gregory Lum, library director at Jesuit High School in Portland, Oregon, and an adjunct instructor for Portland State University. The pages numbers in this guide correspond to the hardcover edition (ISBN: 9781481437868). Annie Donwerth-Chikamatsu lives in Tokyo, Japan. Her work has been published in Hunger Mountain, Highlights, Highlights High Five, Y.A.R.N., and other magazines. 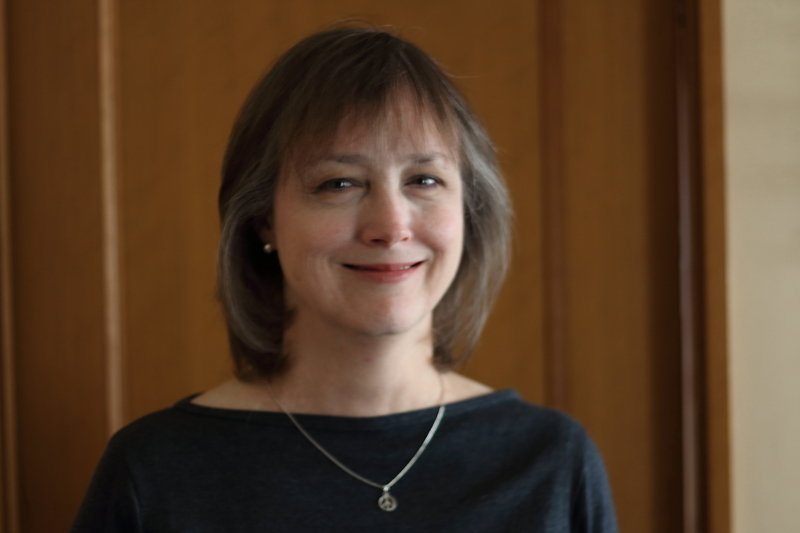 She received a grant from the Highlights Foundation to attend Chautauqua in 2009. Somewhere Among won the 2013 Writers’ League of Texas award in the middle grade category and is her debut novel.